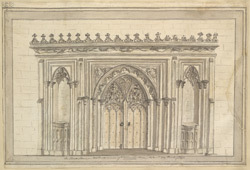 Sketch by T. Baskerfield of part of a door into the cloister at St Albans Cathedral in Hertfordshire. An Abbey was established by Offa, King of Mercia in 793 who took advantage of an already existing religious community here who venerated the site where St Alban had been martyred in about the year 303. The Abbey became one of the wealthiest and most powerful of Benedictine houses in England and in the 11th century it was rebuilt and extended. Much of this work is still visible remains and the Abbey is one of the most important examples of Norman architecture in England. It is thought that this door was built in about 1155 by Robert de Gorham who repaired the original shrine to St Alban and rebuilt the cloister and chapterhouse. The doorway was rediscovered in the 19th century.